Old Geezer (a.k.a. Mike Monard, a member of Gary Gygax and Dave Arnerson’s game groups) is answering lots of questions on this thread on RPG.Net. The thread is an interesting reading for fans wanting to know more about our hobby’s history and for Gamemasters in general that are curious about how things were done back in “ye olde days”. Balance comes exclusively from role protection. You can do your thing, I can do my thing, and it's very, very hard for me to do both my thing and your thing at the same time. Which is a major shift in the game. OD&D does not assume that we will be adventuring together. Though all four character types are useful, none are necessary. Clerics fight almost as well as a fighter so they're good for defense, but in a real melee combat the fighter will shine over time. It's nice to have magic users, but once you have magic weapons and some good clerical spells, you can dispense with them if necessary. Et cetera. There is no "you will not succeed if you do not have the following things in your team." You may WANT them, but they are not necessary. In OD&D the highest level of play was solo adventuring, no henchmen, NPCs, or team. Just you. This is really interesting stuff and it creates a “new” (for me at least) framework for high-level campaigns in D&D (and d20 and Pathfinder in general). It made me want to run such “solo” games but – given the way that today’s group dynamics work – it might work better as a troupe style game. Each player would get an adventure for his high-level character, while the other players would act as his followers and Cohort (speaking in terms of 3rd Edition/d20 games). This playing style also addresses a recurrent problem in my (short lived) high level campaigns: verisimilitude. It’s often hard for me to created plausible (and frequent) hooks and adventures for the ENTIRE high-level party to participle. After so many sessions, encounters, adventures etc its normal for my players to have multiple personal goals and side quests (Adventure Paths are an exception because they’re not written by me… and even them I’m noticing that my current players already have multiple side-quests at my Curse of the Crimson Throne campaign). It just makes more sense for me that each powerful PC would eventually have his own agenda and adventures, disconnected from the original group (excepted in special occasions). In fact, I know many campaigns (including mine) where, when you stop to look and think, there isn’t really any excuse for a party of high-level medieval superheroes to be walking together around wildlands/dungeons anymore. High-level PCs should only work together when their goals/challenges converge. If the party’s 13th level Fighter wants to kill that dragon that is plaguing his lands it makes sense that he’ll call for his old friends’ assistance. Et cetera. That’s something that I hope to try in future games; maybe after the main plot of Curse of the Crimson Throne is concluded. Another interesting speculation brought up in thread is the role of the thief (from Supplement I: Greyhawk) on OD&D and how the class plays really well alone – or just acting as a general scout/spy of the party. 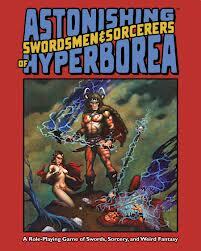 This augury is based on the PDF version of Astonishing Swordsmen & Sorcerers of Hyperborea (or ASSH). This is a typical “2nd Generation” retro-clone (i.e. it doesn’t try to emulate any D&D edition, been rather a mix of elements drawn from various sources, aimed at running classical sword & sorcery adventures). The PDF version (for just $10) has 5 PDF files – a character sheet, the box lids, the Hyperborea map, the Referee’s Manual and the Player’s Manual. The layout is simple, with a classic-looking format (for Old School products at least). The B&W art, however, is beautiful and very flavorful. In fact, the art clearly is a very important part of ASSH (and of the setting of Hyperborea). 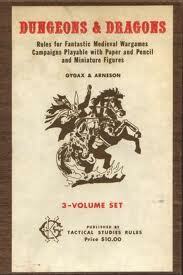 The Player’s Manual is actually made of 3 Volumes: Swordsmen & Sorcerers; Sorcery; and Adventure & Combat. ASSH use the traditional six ability scores, with tables of modifiers reminiscent of Greyhawk/BECMI – the novelty here is that ability tests use a d6 (a nice touch, maybe inspired by the rules in the LBBs). 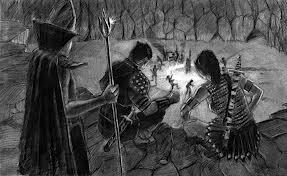 As a true sword & sorcery game, ASSH uses only human races – from Picts and Kimmerians, to Vikings, Ixians and Hyperboreans (there no mechanical distinction between them). The next part of ASSH deserves it own paragraph: classes. First we have the 4 classic ones: Fighter, Cleric (a surprise for me), Thief and Magician. Each class has a Fighting Ability, and spellcasting classes also have a Casting Ability. Although Clerics get a tweaked description – better suited to sword & sorcery settings –, mechanical-wise they aren’t different from the traditional divine spellcaster that we all know (although Turn Undeads uses a d12). Both Cleric and Magician are a little disappointing in this regard (if you want a more “faithful” sword & sorcery spellcasting system, check Crypts & Things). However, if 4 classes aren’t all that interesting, the same can’t be said about the subclasses – these are just awesome. Basically, ASSH breaks down each original class in 4 subclasses. Fighters get Barbarian, Berserker, Cataphract, Paladin, Ranger and Warlock; Clerics get Druid, Monk, Priest and Shaman; Magicians gain Illusionist, Necromancer, Pyromancer and Witch; and Thieves gain Assassin, Bard, Legerdemainist and Scout. Each subclass keeps the original rules (no different spellcasting systems) but customizes them to fit the new archetype. They look balanced and very fun to play with – actually, the subclasses alone make this PDF a worthwhile acquisition. ASSH uses the Holmes Edition 5-tiered alignment system and a unified saving throw number (modified by ability score modifiers and classes). It also uses Second Skills and Weapon Skills system (inspired by AD&D 1st I guess). Where ASSH innovates is with armors – here they grant both a better defense (lowering your AC) and a small damage reduction. The rules on Morale, Hirelings and Henchmen are clear and very well described. There’re also sections on a party’s Base of Operations, Adventure Preparations, Actions and Pacing. The basic Task Resolution system uses a d6. Combat is relatively complex (looks like something taken from Chainmail, or maybe derived from Holmes, I’m not sure). It’s divided in 2 phases, each further divided in 4 steps: melee, missile, magic, movement. Initiative uses d6, with ties resolved by Dexterity. Tactics are henceforth important because things like movement establishing when your character attacks inside the combat sequence. ASSH also provides rules for unarmed combat, grapple, pummel and other maneuvers – and we’re not even into the advanced section yet. Yes, there is an advanced combat section, covering 22 new maneuvers (like Dodge, Indirect Fire and Parry & Block) and a critical hit system. I admit I was a little disappointed with the later – I was expecting tables, not just damage multiplier rules. On saving throws, damage and special damage sections the only part that stood apart for me was the new Healing rule: you recover one rolled Hit Dice (plus Con modifier) for each night of rest (minimum 1). It’s a simple with very interesting rule that I’ll surely use on my D&D games. ASSH grants XP by attendance, slaying/capturing monsters, treasure, clever use of ability, problem solving and achieving adventure/campaign goals. It also has detailed rules for aerial combat, waterborne expeditions, castles & strongholds and warfare & siege (YES!!!). The mass combat rules are abstract, but there’re guidelines for troop movements and provisions. I feel that there’s a sense of completeness on ASSH, which I sorely missed in Adventurer Conqueror King. 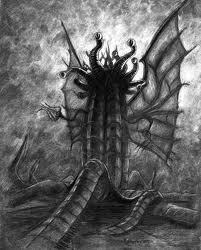 Now to the Referee’s Manual: this PDF is composed of Volumes IV (Bestiary), V (Treasure) and VI (Hyperborea). The Bestiary has a nice selection of classic and pulp monsters, including dinosaurs, bird-men, really lots of Lovecraftian goodness, creatures directly inspired by Smith’s tales (like the vhuurmis) – curiously there’re no dragons. We also get various encounter tables. Volume V’s highlight for me are the occasional pseudo-technological items (the kind of thing you expect to find on Atlantean ruins or Elder Things’ cities). I told you that I bought ASSH only because of its subclasses. Well, if you think that that is not enough for (yet) another retro-clone then here is a bonus – the campaign setting of Hyperborea. 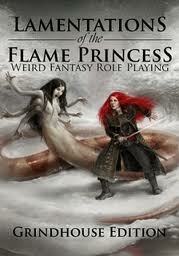 This is a really great mash-up of Weird Tales fantasy plus D&D elements and classic mythological stuff. It’s also an amazing take on the entire idea of Smith’s Zothique Cycle – including the bizarre geography and dying sun. The references alone here put a smile on my face. ASSH don’t hold punches with Hyperborea. The setting is richly described, with care and attention, though not richly detailed – and that’s an important distinction for an Old School product. There aren’t city maps, organization or NPCs lists, and neither lengthy descriptions of each town, city, land, island or mountain range. There’re excellent guidelines on the general geography of the land (including a very cool lunar calendar); a short timeline (with a cool reference to (The Coming of the White Worm); and basic details on famous locations, ruins and noteworthy city-sates. Among OSR products, this is definitely one of the best settings so far, on par with stuff like Isle of the Unknown and Carcosa (and not as polemical, which may be a selling point for some). Yesterday I managed to run my first OD&D (LLB-based) session to my wife. After her first horror-laden LotFP game, we agreed in trying something more traditional. Because she has been reading The Hobbit (the comic book) to our daughter during the last month, I picked its setting (without any regard to The Lord of Rings) as a starting point. She quickly created a Dwarf Fighting-man of 1st level. It’s interesting to note that her greatest difficult during the character creation process was why her dwarf was adventuring and what was his name. I offered some suggestions for names and allowed her to roll a background randomly (on a table I made). She discovered that her character was searching for his missing brother. She quite liked the random background idea. The session started right in the wilds, with the discovery of a mule track (reputedly belonging to the missing dwarf) leading to a sinister pair of solid wooden doors in a otherwise normal cave entrance. Having learned a little bit about the risks of dungeon delving alone, she decided to retreat to the closest village to find some hirelings. Searching at the local inn, she tried to recruit the patrons: an itinerant goldsmith, a potbellied peddler and a foreigner wanderer. The goldsmith was very interested but didn’t want to share any findings with the other two, while the peddler found the entire enterprise too risky. The silent foreigner accepted the job after our hero agreed to give to him the first 50 gold pieces found (after which they’d discuss future shares). The entire scene was pure roleplay (I didn’t bother with rolling reactions). I quite liked the fact that my wife readily mistrusted the mellifluous goldsmith, but decided to trust in the weird foreigner (and no, she never read The Lord of the Rings’ classic Strider scene at the Prancing Pony inn). The decision proved right, because the goldsmith was actually in league with the local bandits (besides other factions that I’ll not mention as my wife sometimes read these posts). Their journey to the mysterious sealed doors was interrupted by a quick assault of the aforesaid bandits. 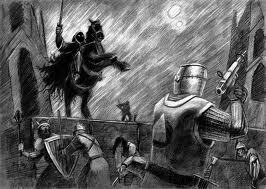 After felling two of the brigands, the others fled. Because it was late we decided to end the session before delving into the mines. Second observation: a rules light game doesn’t mean a preparation-less game. I really regretted not having prepared myself more for this session. While my previous LotFP was run basically on mood and mystery (two themes that I’m quite comfortable improvising), this OD&D session required expertise at an area that I’m rusted – exploration. I did have a NPC random table and two encounter tables, but I felt that they weren’t enough. I believe that the game felt too “vanilla”, and I think that my wife felt the same (another conclusion could be that we’re both just tired). Anyway, after our small session, she confessed to me that the LotFP felt more tense and mood-heavy. 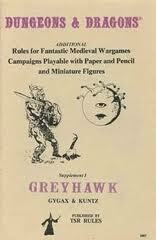 Compared to it, OD&D was a lot more straight-forward and light, besides tactical. I guess she missed more weird/unusual NPC interactions. [At this point I must point out that I’m usually a Gamemaster that enjoys NPC-heavy games. However, I really wanted to try an Old School approach. 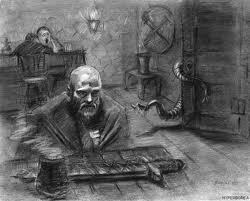 So, I wanted to avoid games where my players consult patron-like NPCs about what should be their next move. As a consequence, the game’s dynamic was a little strange to me and – I guess – my wife.] As I said, I think that I should have dedicated more preparation time to the village and the local wilds – two elements that I thought could be left open and filled “organically” with random tables in future sessions. Let’s leave my game impressions at this point. Next session should reveal the true “heart” of this (would-be) campaign: the exploration of the mines and the hunt for the missing brother. If the next session or two doesn’t develop well, I’ll suggest to her that we attempt a new LotFP game – the way I see my wife enjoys more mystery/investigative adventures than exploration ones. Ok, time for the rules stuff. I used the LBBs as the base system, with a few bits from Chainmail (particularly dwarven racial benefits). I added waysofetheearth’s Combat That Scales (which I really loved). I used the Shields Shall Be Splintered! and a Binding Wounds rule (1d4 hit points, only if done after battle, followed by a small rest). I granted a simple Cleave-like mechanic to the Fighting-man (if you drop an enemy you gain a free attack) – I may change this to the classical Chainmail rule about Fighting-man gaining extra attacks against 1 HD monsters. Because an OD&D game with one player is very lethal, I stole the Flag System from the great E6 mini-game. Basically, I established that I can’t kill the PC unless the Red Flag is raised (this is represented by a red d6, which is passed to me). This doesn’t grant plot immunity – there’re several things worse than death (like being turned to stone, mutilated or imprisoned for life). When the Red Flag is raised I grant my wife 3 re-rolls to be used as she wishes. Two-handed weapons damage uses 2d6, picking the higher. Fighting with two weapons grant a +1 to hit. Many of these rules were inspired by the excellent Philotomy's OD&D Musings. The Flag System is really a radical departure from Old School standards, I know, but I’m trying to use this OD&D campaign as a small tutorial. After all, I have only one player and one that hasn’t played for 10+ years. If things runs fine I’ll probably abolish the rule in the future (approximately at 3rd level) – though I might grant re-rolls as a special reward system. Besides this rules, I'm really attempted to strive as close as possible to the LBBs – Ability Scores in general grant small or no benefits (the most important one being extra XP), all attacks deal 1D6, I’m not using nothing from Greyhawk and other supplements etc. For those you that are running adventures based on the LBBs, I can’t recommend enough the Original D&D Discussion forums. They’re a great gaming community and excellent folks to chat with. Their material and topics are also top-notch for those interested not only in OD&D as hobby history, but also as a game to be constantly played, tested and developed. The Simplified D&D Combat that Scales – by the user waysoftheearth – is my latest finding there. It’s a really amazing analyses of the OD&D combat matrixes, besides an intelligent (and fun) fix to make combat scale to their higher levels (especially if like the OD&D damage rules where every strike does 1d6 points of damage). This last week was a really good one for me. I finally got some rest from traveling for public exams, work was easier, and while our little daughter is the most Chaotic Neutral creature I’ve ever seen, she’s also a boundless source of joy for us. So, things are running smoothly (except for this blog… I really need to update it more). On Monday my Lamentations of the Flame Princess Grindhouse Edition finally arrived. I had already read the rules available online and quickly borrowed the non-Grindhouse Rules & Magic and Referee books. However, I never managed to read the whole package. It’s really an engaging game. Raggi managed to do something that I considered impossible – to create a unique and strong flavor, all by just using the basic D&D Rules (tinkered here and there, but still pure Old School). I was planning to run a true 3 Little Brown Books game for my wife. She played RPG before (some 10 years ago I guess) and wanted to try again, so I created a solo game for me. She said she wanted to play with a Dwarf, but at the last moment changed her mind and decided for a Cleric. I thought that the official OD&D Cleric was a little “dry” at 1st level. I also was really tempted to use my shiny LotFP box. In the end I switch systems in improvised a dark Medieval adventure, based on the dungeon I had draw for the OD&D game. I still hadn’t familiarized myself with the LotFP rules (I read them more 6 months ago) but I thought I could wrap things up by concentrating in the roleplay and mystery aspects of the adventure. My wife’s Cleric was a poor member of the Holy Order of Saint Cyprian (this Crypian). We made the Order on the spot, because I think St. Cyprian of Antioch is an excellent patron for a spellcasting crusader. The adventure was about a small town in middle of the Holy Roman Empire’s dark forests. The local villagers had an old pact with chthonic fey spirits, which helped them in mining gold from the local mines. Things were fine until a priest came to town. He destroyed the pagan altars and symbols and took all the gold for the Church, as penitence for the sinner inhabitants. Presumably, he was killed and buried by the villagers, who were automatically afraid that the Church would send more priests (or an inquisitor) and kill them all. In this scenario, my wife’s Cleric came up. After investigating the village – and discovering little, besides the fact that something was clearly amiss – she decided to journey to the so called “haunted mines”. Unfortunately the local fey were just too happy to trap a priest and smash him to pieces with their pikes (think of kobolds, but make them really creepy, and mostly invisible). My wife forgot that she could retreat and didn’t survive her fist encounter after the fey managed to steal her torch and left her character in the dark. The session was short but very fun and I was delighted by my wife’s reaction: she was half scared half excited by the whole story. Better: she ask me when she could make a new character. If everything goes right, we’ll another game try again this Sunday (this time I promised here that I’ll run something more lightly, so I’ll use only my LBBs… for now). LotFP is very easy to run, thought it did take some time for me to remember that the ACs run from 12-to-18, not from 10 to 18 (or more). I also had to check the shield rule (and I used the Shields Shall be Splintered! famous rule). I really love Raggi’s version of the Cleric and it was the sole reason for switching at the last time my game system for the night. I actually wrote this spot to share some ideas about LotFP implied setting. It’s clearly based (to me at least) on a late Renaissance/early Modern Period. I know that there’re firearms rules coming up in a future module, but what I missed most was a distinct division between evasion/armor. For Modern games I really like to keep those things separated. I’m entirely aware that his prejudice comes from the whole “firearms destroyed armor” issue (and yes, I known that the bow did the same thing centuries before). Anyway, I wished to make unarmored Fighters a viable option. My first reaction was simply to use a character’s Dexterity as his Defense Class (AC sounds weird here). Other option – given that LotFP’s armor runs basically from 12 to 18 – was to make the DC equals to 9 + ½ Dexterity (thus a Dex 3 would give you DC 10, Dex 10-11 would give you AC 14 and Dex 18 equals DC 18). By using DC instead of AC I could use armor as damage reduction (I thought about using it as a deflecting defense, but it sounded too complicated). Because LotFP uses really low damage bonus, this rule sounds perfectly here. Maybe leather granted DR 2, chain DR 4 and plate DR 6. Some weapons would pierce or ignore ½ of the DR – like firearms at close range (pierce) or maces vs. plate (ignore ½). Shields would grant a bonus to DC. Just a few ideas. I’m not sure I’ll use them yet. Wicked Fantasy started as series of articles for Kobold Quarterly. On each article, author John Wick would propose an alternate version of a Pathfinder Core Race. Humans, elves and dwarves would get an “Ecology of…” article, but rewritten as something completely different from their standard/traditional roles. Those Kobold Quarterly articles were provocative and made you think beyond the usual rules and flavor. John Wick expanded on each original article, starting the Wicked Fantasy series. 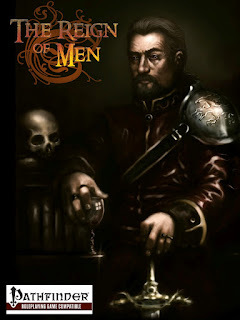 This review is based on the PDF versions of the The Reign of Men (Humans), Children of Pain (Orks), Seeming Servants (Haffun), Guardians of the Wood (Elves) and For the Pack (Gnolls). Before delving further, one last observation: John Wick’s material is renowned for having a strong “author’s voice”. Wick also enjoys creating fictional languages and a long series of alien words. If you don’t like it, stay away from Wicked Fantasy. If you’re a fan of traditional mechanics, this series might also disappoint you, particularly because the author’s tastes to mix mechanical bonus/penalties with roleplaying elements – a design approach many find unsuited to Pathfinder/D&D. Ok. Enough background. To the PDFs. “Physically” speaking, each product is a 26-34 pages color PDF. The text is edited in a two column format, and the pages’ background is beautiful. The art is rare and usually of average quality. To our first ebook: The Reign of Men. Humans here are described as the oldest race of the Known World. Ancient, proud, brave, passionate, cultured and intellectual. They don’t follow or honor the Gods, but the human spirit itself. Philosophers occupy the role usually reserved for priests and democracy is the chosen form of government. Think about a fantasy (and modernized) view of the Classic Greek ideals and world. It’s quite a change of pace, but a refreshing one and I really enjoyed these “new” Humans. They’re really unique. Mechanically speaking humans now are good with teamwork feat and rally-like mechanics, gaining lots of racial traits and feats geared toward these effects. The Reign of Men describes 2 new domains (Humanity and Philosophy) and 2 new archetypes (Philosopher and Palatine). The Reign of Men also details the Human’s greatest cities and gives general hints about the Known World. Next PDF: Children of Pain. Here we get our new Orks (with “k”). Flavor- and mechanical-wise this is definitely my favorite Wicked Fantasy so far (though I have high hopes for the Dwarves’ PDF). The idea behind Children of Pain is simple but awesome – imagine if the orcs, creatures breed to serve dark gods, eventually got tired of their lot and (literally) killed their deities. This is exactly what happens here. Finally free of their servitude and red rage, the Orks are slowly adapting as a full race. However, changing one’s nature is hard and the Orks are essentially creatures marked by pain. 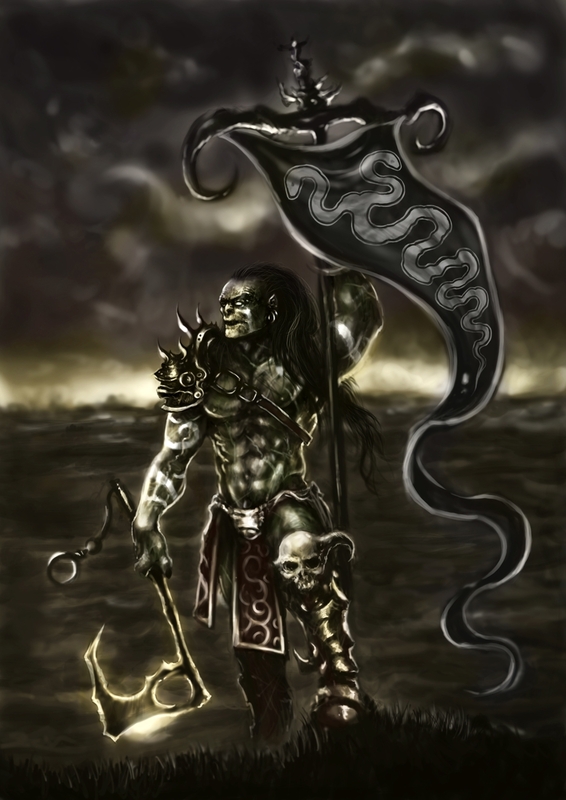 Today, through their blood shamans, Orks kind of “worship” Pain – not as something evil or that should be inflicted upon the world, but as force to be endured to make oneself stronger. Children of Pain’s take on the Orks is interesting, from the “reskinning” of the race and some classes (specially the blood shamans, an oracle archetype), to entire new elements, like the whole idea of “orkfriends”. Most abilities (like feats) deal with the idea of pain and grant bonus in exchange of damage. It’s something hard to balance mechanically but the authors make it workable (if not fine-tuned). There are also rules for scars, god blood, a barbarian and bard archetypes, among other stuff. The little ones: Seeming Servants. This is the PDF about the “new” halflings. It was also the first article presented in Kobold Quarterly. John Wick took a really new perspective on halflings, while ironically keeping their initial flavor. No cannibal, otherworldly or kender-like halflings here. No sir, the Haffuns are true Hobbits, but with a clever twist – they’re the perfect servants. Think of an entire race dedicated to serve others and to understand someone’s inner desires. While the fluff here is terrific, the mechanics are a bit odd for me – especially the new base class: the Butler (yes, you play Alfred). Now for the (likely) favorite of everyone: Guardians of the Wood. These are John Wick’s elves (no, unfortunately not those elves). Elves in the Known World are creature literally bound to nature – their rulers are bound to the immortal Great Trees, their nobles to other trees, while their servants are bound to the soil. Each type of elf gets distinctive mechanical benefits that fit perfectly with their flavor. There’re also rules for elves whose trees were destroyed or who’re iron-bound – severed from their tree-connection by iron shackles or chains. Before you ask: yes, there’re also “dark elves” and they’re excellent! 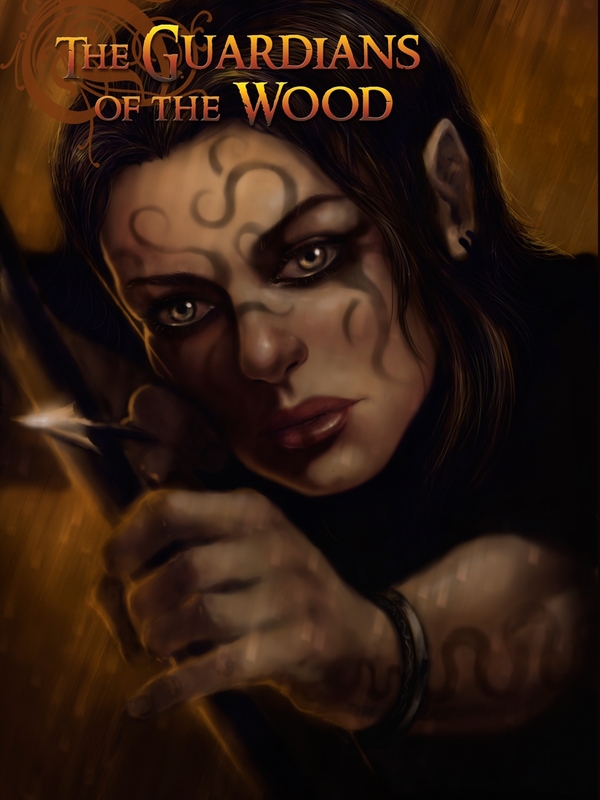 Guardians of the Wood is probably the Wicked Fantasy product where Wick better mixes setting with mechanics. There’re new feats, racial traits (lots of them), 4 new archetypes and a new prestige class. The Summoner archetype is the best “reskinning” of the class that I’ve seen. 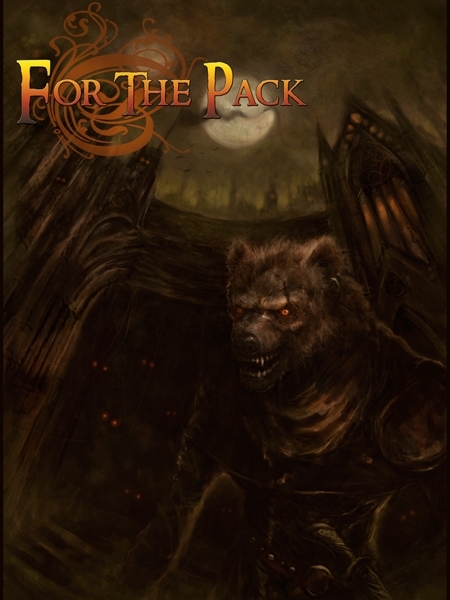 For the Pack is the Gnolls’ PDF. I had really high expectations for this one. Gnolls are so classic and well-known by now that they deserved to be made into a full (flavor-wise) PC race. This product was a wonderful opportunity to make justice to the “Beastmen”. Unfortunately what we get is a pseudo-wolfmen race (though I liked the Seven Moons part). To make things worse, the mechanical aspects of For the Pack are overly complicated because they presupposes that gnolls spent 99% of the time moving in packs (even adventurer gnolls). There’s even a feat for buying more gnolls to your pack. While the idea is great and offers the chance for troupe-style adventures in Pathfinder, I found the rules lacking. For the Pack deserved to be a bigger product, with the page count necessary to properly address the complexities of integrating a pack mechanic do d20. Definitely the most curious and interesting aspect of For the Pack is the setting, where its revealed that the Known World has seven moons. Wicked Fantasy is a refreshing idea and John Wick is the perfect author to engage you – it’s hard to stay neutral to his material. 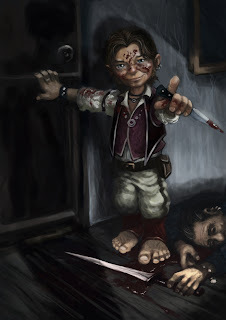 Even if you don’t like his halflings or elves, each PDF gives excellent ideas. I just wished John (and those that are helping him) had a better grasp of the Pathfinder mechanics. The Reign of Men don’t use complex rules – theoretically humans here are good at aiding others and working in teams – but the author’s implementation of rallying mechanics is a bit off (for me at least). Actually most Wicked Fantasy PDFs have strange bonus progressions for racial traits and feats. For the Pack is really bizarre on its mechanics. One aspect that I liked about the whole series is that it uses a common (implied) campaign setting. This is really cool, especially given the fact that is easy to ignore the Known World and adapt the “wicked” races to your own setting. Another thing that I enjoyed was the cultural characteristics of each race – they felt really unique, different and engaging. Actually, these different traditions, secrets and taboos are perfect for running campaigns where the PCs are foreigners. Of all the PDF, I felt that The Reign of Men and For the Pack were the weakest. The former adds little (of useful) to the original Kobold Quarterly article, while the later is just too difficult to use without resorting to an “all gnolls” campaign. Seeming Servants is good, though the new mechanics aren’t all that useful (like the Butler class). Children of Pain and Guardians of the Wood are top-notch material, with excellent flavor and interesting new mechanics. I recommend both with gusto. Each PDF costs $5.00.